To help you Danish instructions in patterns you may have purchased from us, we've translated some of the terms most frequently used. The Onion and Multisnit patterns are easy to use, and if you've sewn before you probably won't need much help with the instructions. If you do however, we've put together a list of commonly used terms, and measurement used in the patterns. This page list some random help for translation of patterns. We try to expand the vocabulary whenever we get requests for new translations. Please email us if you think something is missing. Coudn't find a word? Is something missing on this page? Please write us. If you have trouble translating any instructions feel free to email us a few sentences or an image of them and we'll translate them for you. The instructions for the Onion, Multisnit and Minikrea patterns are in Danish and while they're easy to follow, we happily translate bits of the instructions to help you if needed. We cannot offer to translate the entire instructions however. 1. Bust width: Largest horizontal measurement across the chest. 2. 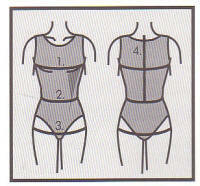 Waist width: The measurement around the waist. 3. Hip width: Largest measurement around the hips ca. 21cm (8,3 imches) below the waist. 4. Back height: Distance from upper vertebrae bone to the waist. Measurements are to be taken as "tight" measurement on to of the clothes you're wearing. Room for moving is calculated into the pattern's size.